A big thanks to neighborhood volunteers for clearing weeds, planting perennial bushes and flowers, and beginning to mulch. We’ll continue filling in more perennial plants and mulch at this gateway intersection to our neighborhood. We hope to see you there to help get the neighborhood ready for the summer season! 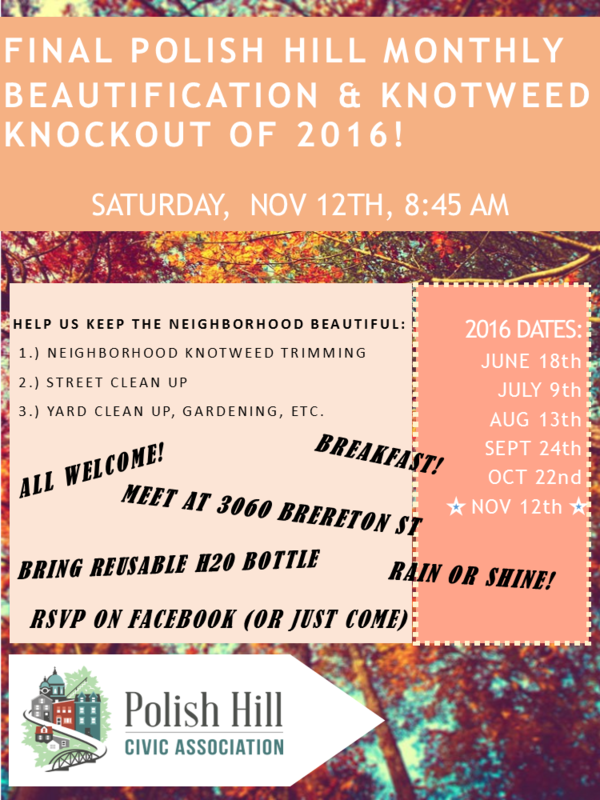 This month’s Knotweed Knockout event will overlap with the Pitt Make a Difference Day and we may have as many as 21 extra volunteers! 1) Street Cleanup crew: Volunteers will canvas the neighborhood on foot. – Collect debris & rubbish from public spaces! – Plant any available bulbs/seeds we have donated. *) Rain or shine, we’re a go! Buckets of suns-creen for the gingers. *) Water/hydration will be provided — Bring a reuseable bottle ! *) Breakfast snacks & whitty-banter: coffee, croisant, danish, fruit etc. 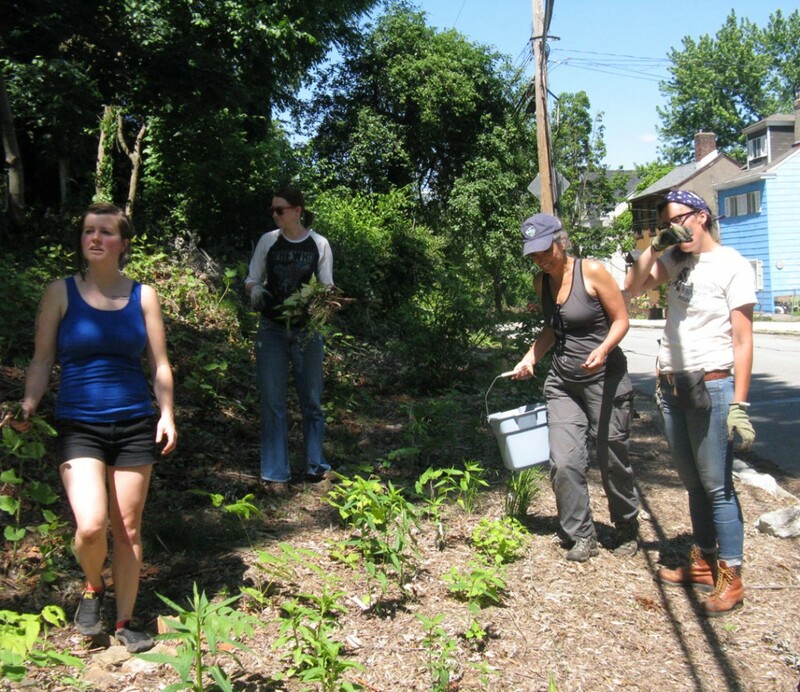 Polish Hill Monthly Beautification and Green-up. 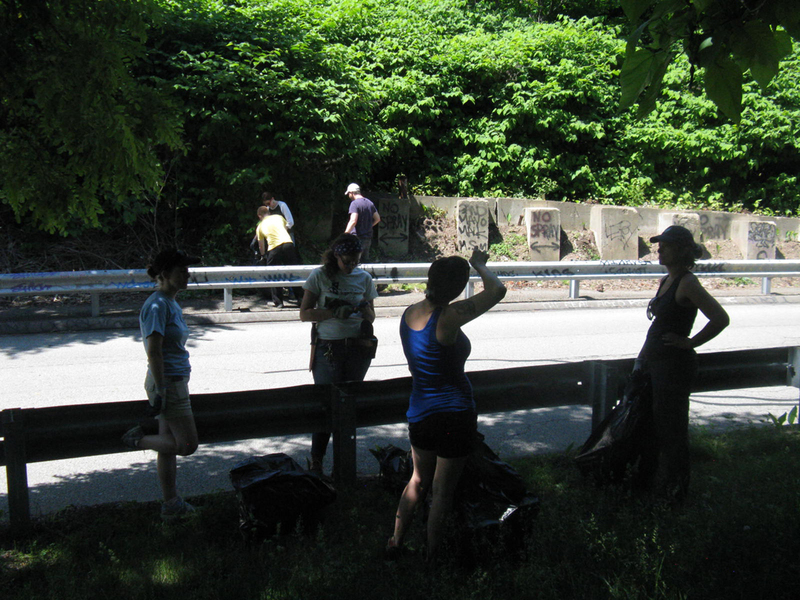 This month, join us in the task of removing invasive knot-weed from a site near the Bloomfield Bridge. Meet at the PHCA center on Brereton at 8:45 am. Bring water, gloves, etc. Saturday, June 18th, 8:45 a.m.
Yard clean up, gardening tasks, etc. Future clean-up dates include: July 9th, August 13th, September 24th, October 15th, and November 12th. 2) Street Cleanup: Volunteers will canvas the neighborhood on foot. Collect debris & rubbish from public spaces! Recycle any recyclables. *) Rain or shine, we’re a go! *) Breakfast snacks & whitty-banter: coffee, danish, fruit etc. Ten hardy volunteers came out on Saturday to tend green spaces and pick up trash on the eastern side of the neighborhood. An earlier date for this cleanup was cancelled due to weather. Weather was no problem on Saturday — it was brilliantly sunny and very warm. First, volunteers weeded and cleaned up the parklet at Melwood Avenue and Finland Street. They picked up trash and cut vines that were choking trees on the hillside by the Melwood steps. The next stop was the Knotweed Knockout site, then Gold Way. Volunteers also took the opportunity to clear some vegetation that blocked the sidewalk. 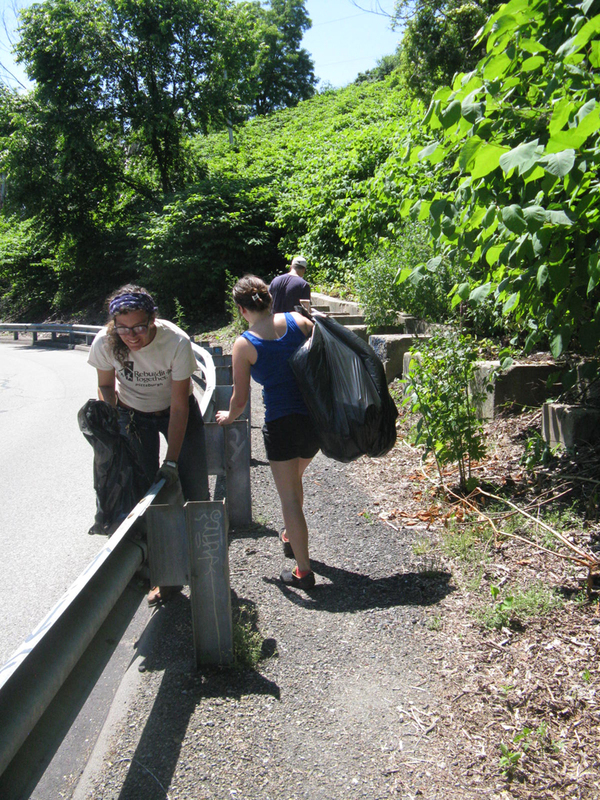 Finally, picking up trash and clearing vegetation on the Apolo steps. Thanks to everyone who came out to help — it looks great! 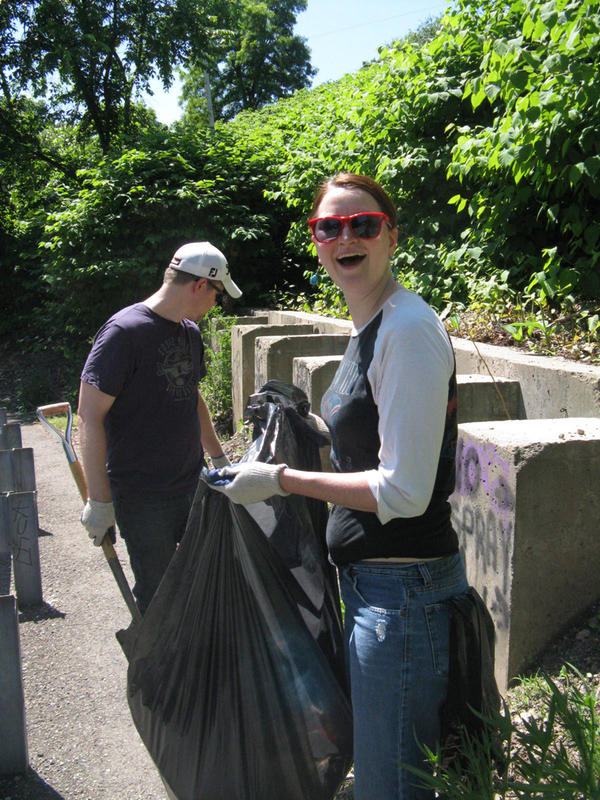 The next cleanup and green space maintenance day will be on August 9. For more information, email valerie@phcapgh.org. 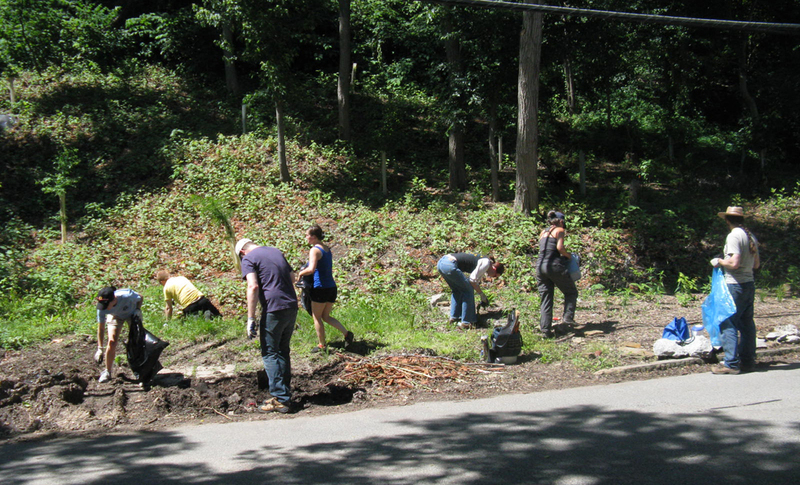 Last Saturday over 20 volunteers came out to help fix up the Dobson Street steps. We already posted some photos, but since then someone sent us more. And since these photos let you see more of the people who helped out, and since we’re really happy with the way the steps look … well, here you go. Above are Dan Pagath and Tom Ogden. 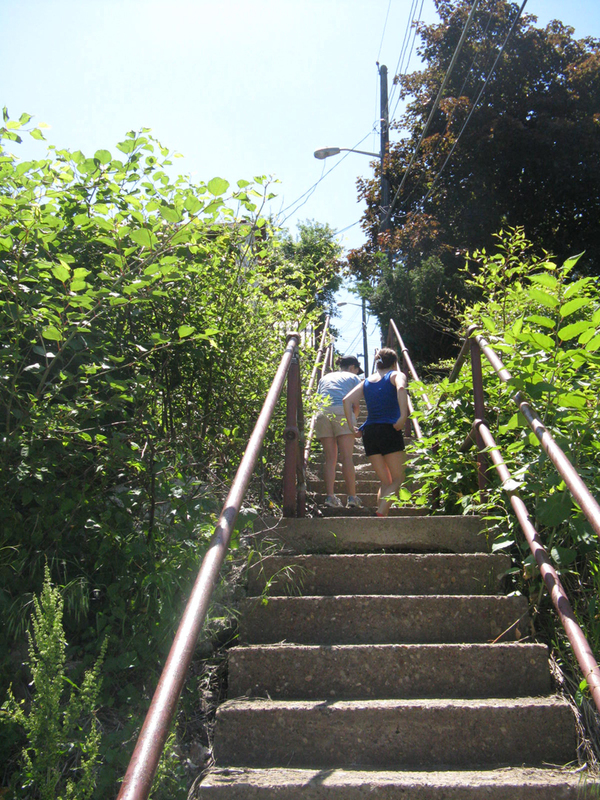 The volunteers also worked on the steps between Fleetwood and Dobson Streets. Here, Sarah Koenig sands the railings prior to painting. Josiah Parkinson paints railings while Terry Doloughty clears debris from the steps. Above, PHCA president Alexis Miller and Herron Avenue resident Sam Pace painting the railings. Again, thanks to all the wonderful people who came out to help! The city steps that connect Dobson Street to lower Herron Avenue are probably the most-used city steps in Polish Hill. They had also been looking shabby, with flaking and peeling railings, broken treads, and trash strewn on the hillside. This morning, over 20 neighborhood residents came out as part of a Love Your Block grant project. They picked up trash, sanded, cleaned and painted the railings, and installed flower boxes at the top of the steps. 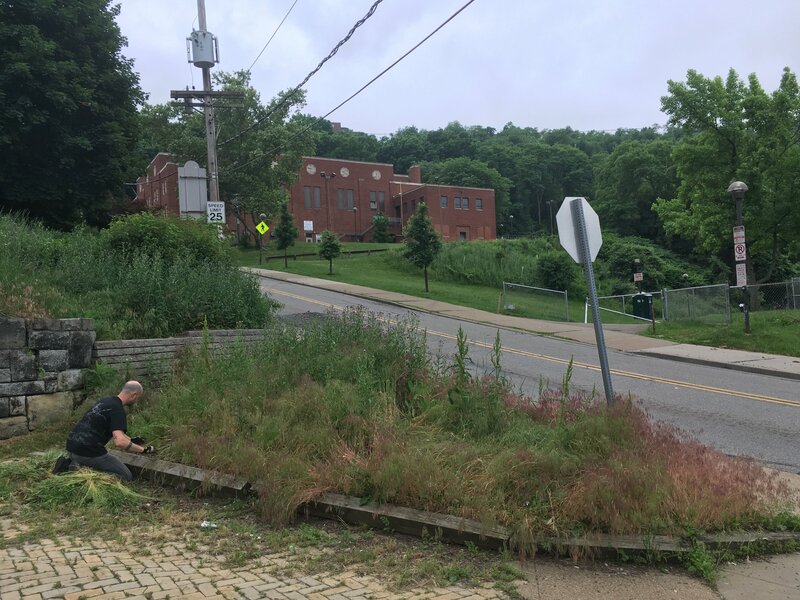 A volunteer braved the overgrown hillside to cut back the knotweed, and a request has been put in to the City to fix the broken treads. Now the steps look so much better! 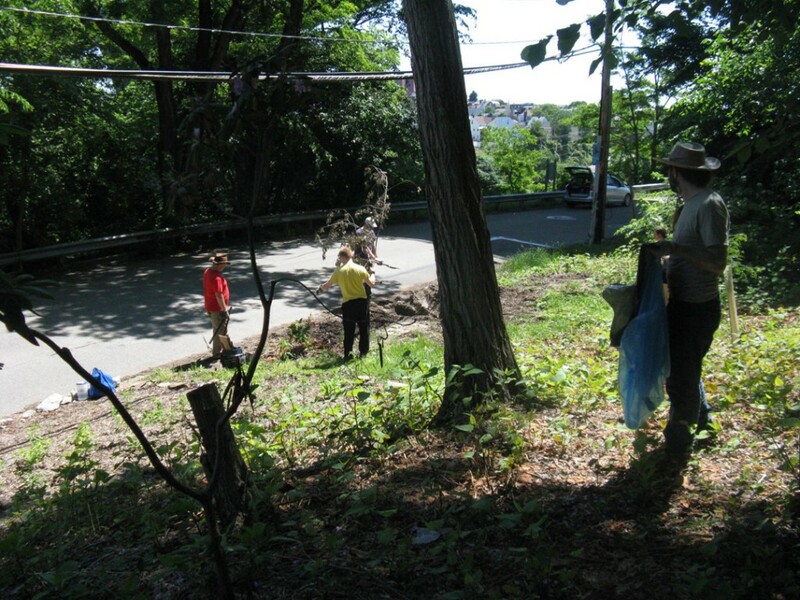 Many thanks to all the people who gave up their Saturday morning to help improve this spot in Polish Hill. 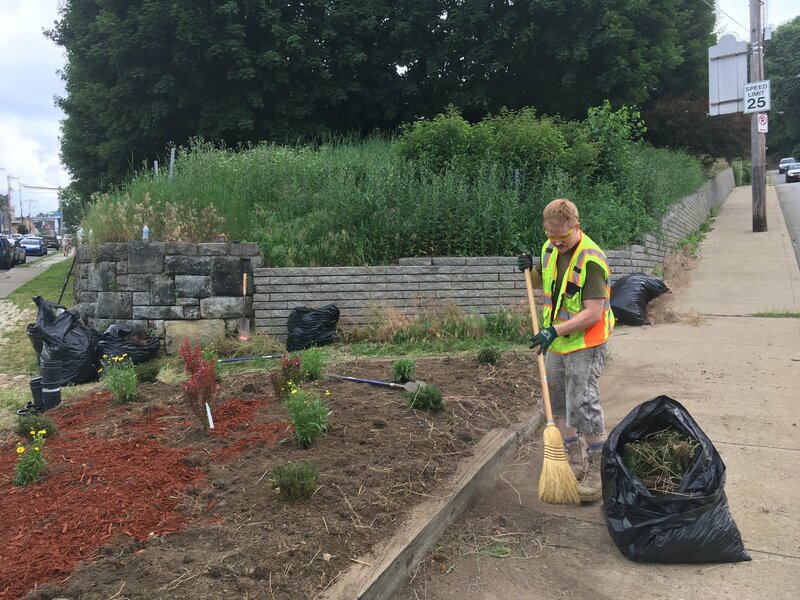 If you’re interested in helping out at future cleanup or green space maintenance events, call 412.681.1950 or email us and we’ll contact you for future volunteer opportunities.